Sheriff Joe Arpaio of Maricopa County, Ariz., responded to George Lopez's profanity-filled tirade against him by telling the comedian to come meet with him. "Get some guts, come down here and meet me face to face. Let's see how you act then," Arpaio, known as "America's Toughest Sheriff," told ABC affiliate KNXV. Lopez has no comment regarding Arpaio's invitation, according to his publicist. Lopez's attack on Arapio was part of the comedian's "It's not me, it's you" standup comedy show on HBO Saturday night. The rant came after Lopez joked that Mitt Romney is Latino but won't admit it. Lopez's comments regarding Arpaio last for about two minutes and included profanities in English and Spanish to a cheering crowd. "Sheriff Joe in Arizona, **** you!" Lopez said during the show. "I was surprised at the language. It was pretty nasty," Arpaio told ABC affiliate KNXV. "What is he, the spokesman for the open border people?" Arpaio told KNXV. "See, I can be funny too. Now let's see if he has the guts to meet me, and I'll be happy to take him to a Mexican lunch." Lopez's Arpaio tirade received mixed reviews from viewers. "We in Maricopa County love Joe and we'll be showing it in November … GO JOE!!!!!!" one viewer posted on Lopez's Facebook page. "You sure put a whipping on Mitt & Sheriff Joe last night. It was hilarious," another posted. Lopez isn't the only person attacking Arpaio lately. Three maximum-security inmates were arrested July 11 for plotting to assassinate the sheriff, according to the Maricopa County Sheriff's Office. Additionally, a class action accusing Arpaio and the Maricopa County Sheriff's Office of racial profiling on the pretense of enforcing immigration laws is set to go to trial July 19, almost four years after it was filed. 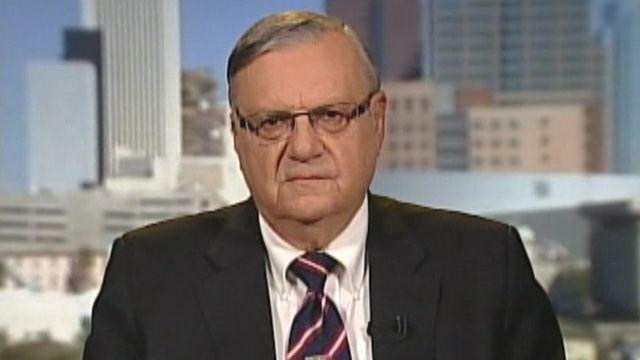 Arpaio will release new information at a news conference Tuesday regarding Obama's eligibility to be president. The information is part of a six-month on-going investigation of the authenticity of Obama's birth certificate by Arpaio and his Cold Case Posse. Arpaio, who has been sheriff since 1993, is up for re-election in November. He will be running for his sixth term.